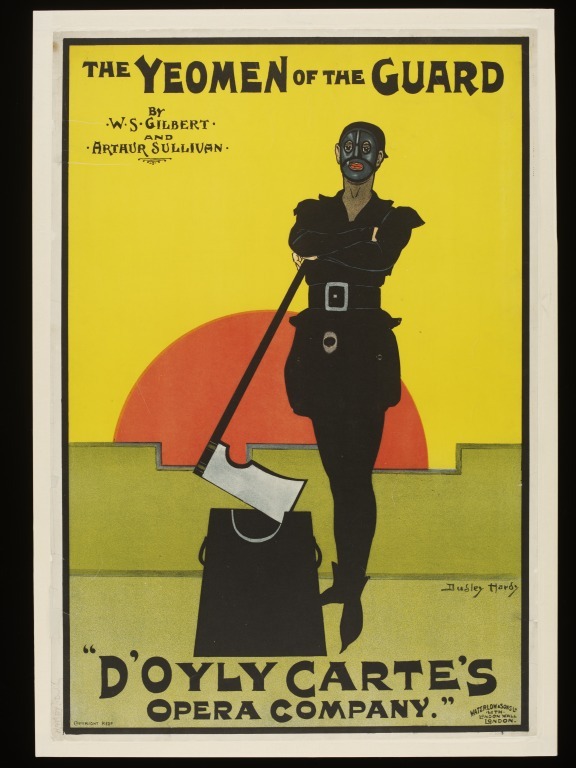 Richard D’Oyly Carte employed Dudley Hardy to design posters for his theatre productions at the Savoy Theatre. 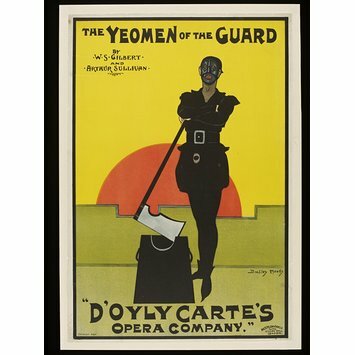 This poster design was for the Gilbert and Sullivan opera Yoemen of the Guard, playing at the Savoy in 1897. Poster magazine of 1899, while praising the vibrant colour scheme, suggested that the executioner was a little too macabre for a comic opera. Dudley Hardy made his name originally as a painter and illustrator. His bold venture into poster design in the 1890s gave him scope for all sorts of unconventional ideas. Although he was influenced by designers of the French 'artistic' poster, such as Jules Cheret, he developed a characteristically English approach with his simplified style and integrated lettering. After his initial success with a poster nicknamed 'The Yellow Girl', advertising the To-Day magazine, many of his earliest posters were commissioned for theatrical productions by the well-known firm of publishers Waterlow & Sons. 'The Yeomen Of The Guard'. Colour lithograph poster advertising a production of the comic opera by W. S. Gilbert and A. Sullivan by the D’Oyly Carte Opera Company. The design shows an executioner dressed in black, holding an axe which he rests on a block. Behind are blocks of colour, the lower half in green representing grass and a crenellated castle wall, and above a large red sun descending behind the wall against a yellow sky. Signed 'Dudley Hardy'. 'The Yeomen Of The Guard'. Colour lithograph poster advertising a production of the comic opera by W. S. Gilbert and A. Sullivan by the D’Oyly Carte Opera Company. Designed by Dudley Hardy. London, England. 1890s. The Poster, Vol. 2, December 1899. Haill, Catherine. Theatre Posters. London, HMSO, 1983. Dudley Hardy was a pioneer of poster design. He believed that a poster should be simple, with little background or detail, and a ‘bold, striking line’ to catch the eye. Poster magazine praised the vibrant colour scheme of this poster but suggested that the executioner was a little too grim for a comic opera.